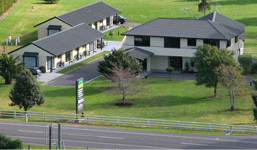 Relax and enjoy your stay in a comfortable, modern complex located in the centre of the Bay of Plenty and in the heart of the vibrant Kiwifruit industry. The Vista has a built in fireplace and lighting. Ideal area for guests to gather. Provision has been made to attach a stretch tent or marquee. The perfect small function venue. Each roomy well appointed unit is fully self contained and serviced daily. For the more adventuresome what about considering a helicopter flight with “Aerius Helicopters”. Numerous walks both bush and on open ground are to be had in the area. Tauranga and Mount Maunganui also beckon with their beaches, shopping and wineries. If you are looking for a central point to base yourselves whilst you explore the Bay of Plenty – you need look no further. Finish your days adventures with a superb meal from the nearby Trading Post Restaurant. Planning a Party, Wedding or Conference – then talk to us. ... Highly recommend this motel!